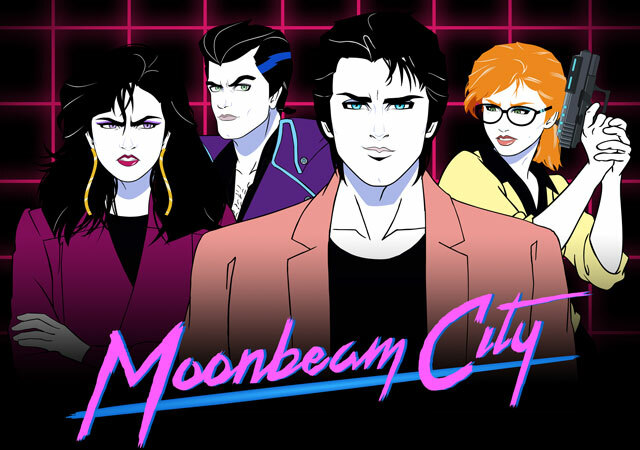 If Archer and Miami Vice had a baby, gave that baby nothing but hard drugs, had that baby live in a world designed by Patrick Nagel (who designed the iconic Duran Duran “Rio” album cover), and hired South Park to be the baby’s sitter, that baby would be named Moonbeam City. 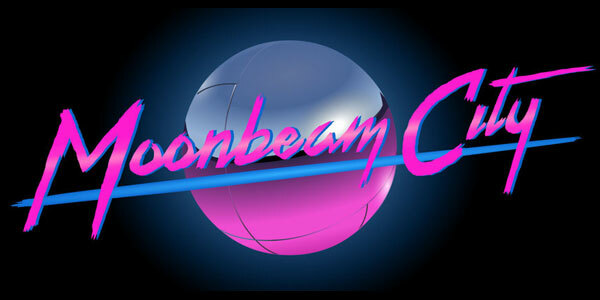 Moonbeam City is a new half hour animated series on Comedy Central. It’s weird, really weird, but funny weird. Rob Lowe voices Dazzle Novak, our intrepid and totally self-absorbed hero who’s the top detective on the Moonbeam City police force. 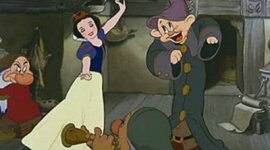 His tough police captain is Pizzazz Smith, voiced by Elizabeth Banks. His rookie partner is Chrysalis Tate, voiced by Kate Mara, and Rad Cunningham, voiced by Will Forte, is Dazzle’s nemesis on the force. You don’t need to have watched this show from the start – there’s not a lot of continuity between episodes, and it doesn’t matter anyway. In addition to the aforementioned fire department and snow leopards, we’ve also had a bizarre man and sea mammal love that turned out to dare not speak its name, a beyond weird visit from Chrysalis’ father (voiced by Patrick Warburton), a bizarre serial killer, several competing true crime reenactments, and more drug kingpins than you can shake a gun at. Basically anything goes in Moonbeam City. Jump in anywhere and anytime – you’ll catch on without trying, which is part of the show’s charm. 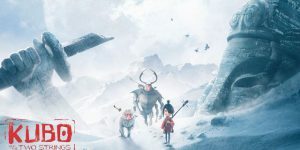 This is a show that understands that style matters, and then ups the style past eleven in order to make sure that the visuals keep you engaged, even as you’re asking yourself what’s going on – for a few minutes until you give up and just go with it. 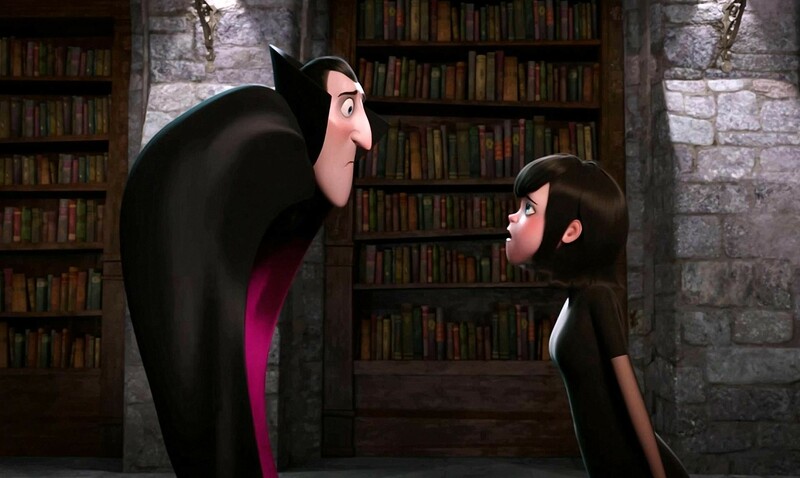 Not that the stories are confusing – well, they’re confusing if you’re looking for typical cop show stories and linear storytelling. If you’re not – and you shouldn’t be if you tune into Moonbeam City – just sit back and enjoy the very wild ride. 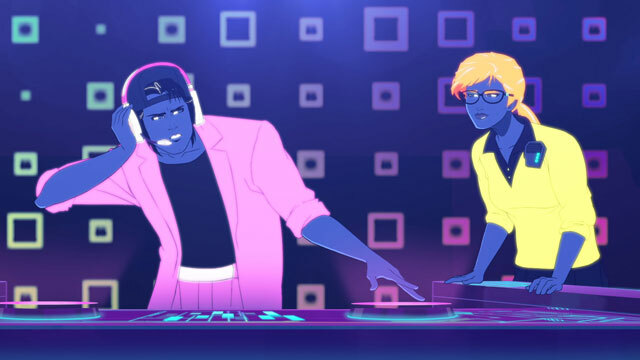 Moonbeam city is getting better with each episode! Comparisons to Archer are understandable with both being workplace comedies with narcissistic male leads, but the visual and audio stylings of this show really set it apart. I can’t wait for the Moonbeam City soundtrack (I “Kiss the Reef in Aquatica” had best be on it!